I want to take this opportunity to wish my Jewish friends and relatives a very blessed Yom Kippur. I continue to be grateful that I grew up in a wonderful religious environment, with Catholics on my mother's side of the family and Judaism on my father's side. One of my fondest memories is celebrating Yom Kippur, a day that is set aside each year for fasting, prayer and forgiveness. Something I continue to find very special about Yom Kippur is the relationship that is defined between God and human beings. An image often depicted is that of God keeping track of our deeds, both good and bad, on a slate. By celebrating Yom Kippur in its fullest sense, there is an opportunity to erase bad deeds from God's slate. This involves a process of apologizing to those we have wronged the prior year. Synagogue prayer on Yom Kippur also is inclusive of multiple prayers for forgiveness. 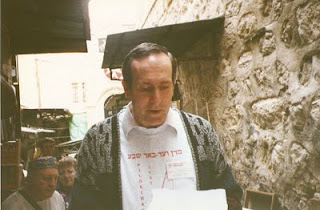 I included two photos above that were taken of me in the holy city of Jerusalem a few years ago. 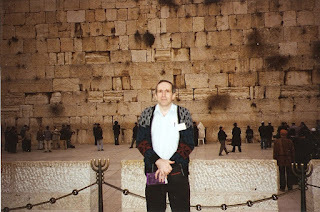 You will recognize the backdrop of one photo as the Western Wall. The other was taken as I lead a group in prayer along the Stations of the Cross. My prayer is that Yom Kippur continues to bring healing and fulfillment to all who celebrate this special day. Due to the pressures and time-constraints of my secular job, and much of my other time being divided between family, ministry, routine errands, etc., I don’t spend as much time on the web as I would like. However, when I do get time to browse, I always make an attempt to feel the pulse of Catholicism in general. One of the raging debates on Catholic blogs/websites concerns liturgical practices. This is certainly a topic that needs to be thoroughly discussed if there is to be a Vatican III council. For those like myself who are old enough to remember, the period immediately preceding Vatican II (late 1950s) was punctuated with discussions and movements that either advocated for strict adherence to the Latin Mass, or an entirely different direction, which would essentially evolve into the Mass in its present form. 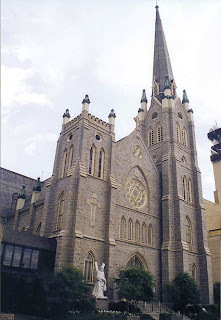 On a few occasions when I have visited in-laws in Little Rock, Arkansas, I made it a point to attend liturgies at the city’s cathedral (pictured above). In each case, I was impressed with the varieties of worship styles that were evident in the weekend liturgies. On one particular Sunday, I arrived at the cathedral in-between Masses. For traditional Catholics, there was enough time allotted between the Masses for recitation of the Rosary and Benediction. The liturgies were arranged in such a way that those with a preference for sung Latin responses would feel totally comfortable in a Mass designated for that purpose. On the other hand, those who favored a more contemporary form of worship would feel comfortable in a Mass designed for them. Although I am known primarily as a reformer, I purposely chose the more traditional form of worship for my visits to Little Rock. The music was beautiful and the Mass was celebrated with a high degree of reverence. My only criticism concerning two of my visits was the homily, whereby I had hoped the homilist would look at the people more than he did, as opposed to focusing his eyes on his text. As conversations continue to evolve in cyberspace and in Catholic circles in general, it is my prayer that some common liturgical ground can be found. Despite all the politics in the church, it is the sacred liturgy that can bring forces of opposition together in their common beliefs. Obviously the challenge of bringing opposing sides together is a monumental task. Consequently, we see multiple conferences throughout the country designed either for reformers or traditionalists, but rarely an opportunity to bring the voices of opposition together. Yet, there is hope. I am encouraged by the fact that an American Catholic Council is being planned for June, 2011. It is scheduled to take place in Detroit and both reformers and traditionalists will be welcome. It will be an opportunity for all to participate in discussions geared toward articulating problems/frictions within the Catholic Church, with an ultimate goal of identifying possible solutions. I plan to be there as a respectful listener, and I will perhaps offer some input. As evidenced by recent events in the political world, the consensus seems to be that we as a society have lost the capacity for civil discourse. It is my prayer that when Roman Catholics debate the future of the church, civil discourse will become normative. I want to take this opportunity to congratulate the City of Rochester on the occasion of its 175th anniversary. In conjunction with this celebration, in the video that follows, I not only mention this milestone for Rochester, but I also highlight the fact that part of the city's legacy is the long history of service from both the Sisters of Mercy and the Sisters of St. Joseph. In any event, I want to wish the City of Rochester well on its 175th anniversary, and I want to thank the good Sisters of Mercy and St. Joseph for being an important part of this history. To wear or not to wear; that is the question (a variation on William Shakespeare). Since being ordained as a married priest, I have worn a Roman collar for either official functions or occasional videos or blog-posts. Obviously, Roman Catholic bishops would prefer that married priests not wear collars, due to the hierarchy’s fear that the public-at-large might perceive these persons to be celibate, diocesan priests. The Roman collar can be seen in a variety of circumstances today. There is even a variation on collar styles, so as to separate Christian denominations. For example, Anglican/Episcopalian clergy have a distinctive circular collar. However, it is not uncommon to see some evangelical clergy or members of the Lutheran and Methodist clergy wearing the Roman collar. I have received all kinds of advice concerning the question of whether or not I should wear a Roman collar. Some married priests, like myself, avail themselves for baptisms, weddings and funerals. In the case of weddings, I leave clerical attire up to the couples. Some prefer that I wear vestments, some prefer that I wear a Roman collar with a suit, and others simply ask that I wear a shirt and tie. At the very least, I try to be as accommodating as possible to those who seek my ministry. Married priests are divided on the collar issue. For various reasons, some prefer not to wear them, even for official functions. In many cases, it is due to a recognition of the fact that some hurt has been caused by the clerical system, whether it was experienced by married priests themselves or by those they serve. However, I am amongst those who feel a Roman collar is appropriate for either official functions or public appearances in which priestly identity is important. On a sadder note, I have spoken with diocesan priests who are afraid to wear their collars in public places with large crowds. Such a place is an airport. 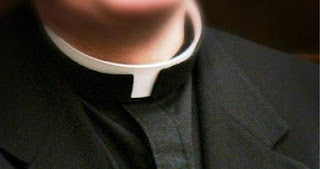 Prior to the sexual abuse scandal, which was officially publicized by the Boston Globe in 2002, priests often wore their collars in a variety of circumstances, even at social or dining events. However, due to the widespread publicity of the scandal, priests continue to relate awkward looks they receive in public places such as airports. Consequently, many priests now prefer to wear their collars only in official capacities. I must say, in retrospect, that even as a married priest, I don’t think I would feel comfortable with a collar in a large public place. In short, to wear a collar or not is not by any means an easy question. As stated above, I often leave my attire up to those I minister to. For the most part, I see a collar as an identity. Just as a uniform identifies a person as a police officer or fire person, a priest (married or celibate) is readily recognized by his or her attire as well. In the end, it is not the clothes that make a priest. It is a combination of one’s spirituality and the call to be a servant to others that are of utmost importance. However, there are times when clear identities are important. Therefore, I respect the right of all priests, whether they be male, female, celibate or married, to make appropriate choices concerning the Roman collar. I was saddened to learn that Erich Kunzel died yesterday. 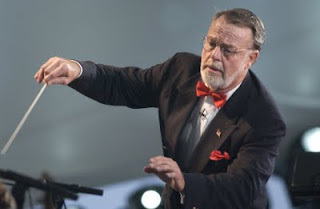 He was the director of the Cincinnati Pops, and I had the privilege of singing under his direction twice when he was the director of the Rochester Pops. In addition to his extremely fine musicianship, Maestro Kunzel was known for his sense of humor. While concert rehearsals can often be tense experiences, Kunzel created an atmosphere of fun, and yet he was still able to achieve the respect of musicians who worked with him. Prior to pursuing a theological path, music consumed much of my life. I am extremely grateful to have met such musical masters as Erich Kunzel. Another master I was privileged to meet was Leopold Stokowski, who told me if I wanted to be a symphony orchestra conductor, I needed to be equally proficient with the piano. I could never master the piano, although I had moderate success with the conducting baton. If there is such a thing as a heavenly pops orchestra, I can picture Erich Kunzel at the helm, alongside Arthur Fiedler. My sympathies go out to Erich Kunzel's family and friends. He will be greatly missed. At least his music will live on via the more than 120 albums he recorded. You may recall that following the consecraton of four married archbishops (just prior to my ordination as a married priest) in 2006, the pontiff called a hasty meeting with Vatican cardinals for a discussion on the celibacy issue. The meeting concluded with a decision to reaffirm mandatory celibacy for priests. However, I am nevertheless encouraged by the news from the Vatican this morning. Those close to Benedict XVI have urged persons such as myself not to give up hope on the issue of optional celibacy for priests. At the very least, he has shown a willingness to listen to reasonable arguments. As parishes around the world continue to close, it is time to place married priests in diocesan ministries. In the meantime, married priests, such as myself, continue to minister independently to those in need. VATICAN CITY, AUG. 31, 2009 (Zenit.org).- The Year for Priests is also for those men who have left priestly ministry, according to Benedict XVI's secretary of state. Cardinal Tarcisio Bertone made this observation Friday in L'Osservatore Romano, in an interview that also explains how the Year for Priests became a reality. "I remember that after the synod of bishops on the Word of God, at the Pope’s table there was talk of a proposal that had already come up in the past, of convoking a year of prayer, which was very linked to the reflection on the Word of God," the cardinal recounted. Nevertheless, he said, "the 150th anniversary of the death of the Curé d'Ars and the situation of the problems that have affected so many priests brought Benedict XVI to declare a Year for Priests." With this initiative, Cardinal Bertone affirmed, the Holy Father wants to show "special attention to priests and to priestly vocations" and to promote "a movement within the whole people of God, of a growing affection and closeness to ordained ministers." "The Year for Priests is bringing about great enthusiasm in all of the local Churches and an extraordinary movement of prayer, of fraternity with and among priests, and of vocational ministry," the cardinal added. He continued, "Moreover, the sometimes weak fabric of dialogue between bishops and priests is being strengthened, and special attention is being given to those priests who have been put to the side in pastoral ministry." The year is also a "renewal of contact, fraternal help, and if it is possible, a reuniting with those priests who for various reasons have left behind their priestly ministry," Cardinal Bertone stated. Finally, he affirmed, "The holy priests who have been part of the history of the Church will not cease to protect and support this road to renewal that Benedict XVI has proposed."